Inspiring Art Teachers to Explore Art History | Curator’s Corner: What is “Contemporary Art”? What comes to mind when you think “contemporary art”? I find it interesting that Picasso and Abstract Expressionism are still considered, by some, to be “contemporary” in the 21st century! Many, many stylistic trends of the last fifty years have been repeated/augmented/copied. Also, many, many people only think of the West (Europe and America) when it comes to contemporary art. I introduce you to a Japanese artist who is truly contemporary and who fuses eastern and western aesthetics: Yoshitomo Nara. Nara is truly a unique artist who defies the terms “modernism” and “contemporary” in his works. Actually, he challenges what the term “contemporary” means. I’m all for dropping the categorization of art, because it smacks of the 19th century academies with their “standards” about what could be considered “fine art.” Though, as an art historian, I am always drawn to finding parallels in an individual artist’s works…. Also, self-portraits are really rare in the history of Japanese art. Hmmm…. One strain of Pop Art in the 1960s emphasized the primacy of comic art and animation as subject matter. It was a particularly strong vein among the Pop artists (called Chicago Imagists, or Hairy Who) in Chicago. This vein was revived during the Neo-Pop evolution in the 1980s. 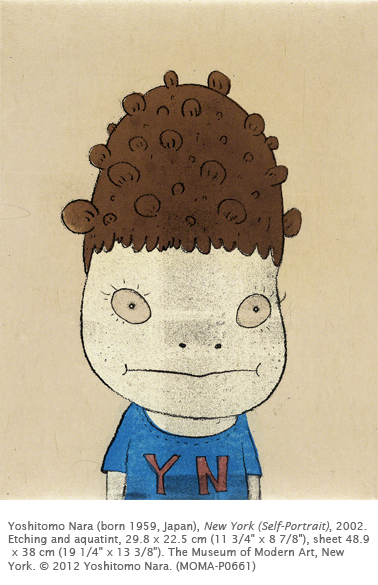 Nara was born and raised in rural Japan by working parents. He spent most of his childhood alone with his comics and pets. He studied art in Japan and Germany. Nara is the “father” of the Tokyo Pop movement. He grew up in post-war Japan when the country’s economic boom was characterized by a flood of popular culture from the West, including Walt Disney and Warner Brothers cartoons. His paintings, prints, and sculptures of wide-eyed children and dogs reflect not only western cartoons, but also Japanese manga (cartoons) and anime (animated television shows). The isolation of the figures, usually on blank backgrounds, could also reflect the boredom and loneliness of his childhood. Self-Portrait does not only express the simplicity of a child’s fierce independence, but also communicates a malaise that reflects Nara’s independent spirit and love of things unconventional. However, the figure is balanced, almost in the Renaissance pyramidal manner and reveals Nara as a sensitive painter. One of Japan’s most popular contemporary artists, Nara’s Pop-like art can also fittingly be found on a variety of consumer goods such as t-shirts, postcards, CD covers, and skateboards.